URIs (directories and files) in web sites. DNS subdomains (with wildcard support). ... something that didn't have a fat Java GUI (console FTW). ... to build something that just worked on the command line. ... something that did not do recursive brute force. ... something that allowed me to brute force folders and multiple extensions at once. ... something that compiled to native on multiple platforms. ... something that was faster than an interpreted script (such as Python). ... something that didn't require a runtime. ... use something that was good with concurrency (hence Go). ... to build something in Go that wasn't totally useless. -fw - Force processing of a domain with wildcard results. -q - disables banner/underline output. -t <threads> - number of threads to run (default: 10). -u <url/domain> - full URL (including scheme), or base domain name. -v - verbose output (show all results). 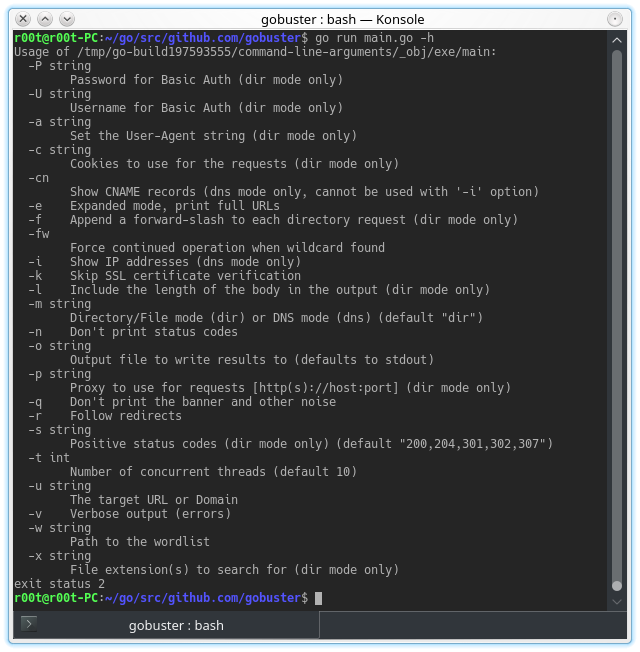 -w <wordlist> - path to the wordlist used for brute forcing. -cn - show CNAME records (cannot be used with '-i' option). -i - show all IP addresses for the result. -a <user agent string> - specify a user agent string to send in the request header. -c <http cookies> - use this to specify any cookies that you might need (simulating auth). -e - specify extended mode that renders the full URL. -f - append / for directory brute forces. -k - Skip verification of SSL certificates. -l - show the length of the response. -n - "no status" mode, disables the output of the result's status code. -o <file> - specify a file name to write the output to. -p <proxy url> - specify a proxy to use for all requests (scheme much match the URL scheme). -s <status codes> - comma-separated set of the list of status codes to be deemed a "positive" (default: 200,204,301,302,307). -x <extensions> - list of extensions to check for, if any. -P <password> - HTTP Authorization password (Basic Auth only, prompted if missing). -U <username> - HTTP Authorization username (Basic Auth only). Since this tool is written in Go you need install the Go language/compiler/etc. Full details of installation and set up can be found on the Go language website. Once installed you have two options. Note: If the -w option is specified at the same time as piping from STDIN, an error will be shown and the program will terminate. Base domain validation warning when the base domain fails to resolve. This is a warning rather than a failure in case the user fat-fingers while typing the domain. [-] To force processing of Wildcard DNS, specify the '-fw' switch. ^C[!] Keyboard interrupt detected, terminating.